Camdeboo Manor: It is not often that one gets the opportunity to luxuriate in the tranquility of the Karoo countryside, knowing that the town centre of Graaff-Reinet is a brief five-minute drive away. 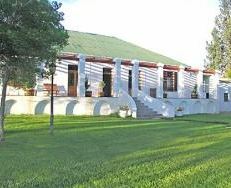 Camdeboo Manor has been created so that guests can experience calmness and serenity to its fullest. To add to the Old World charm of this establishment, the unique and unusual furniture and décor items that form the central motif for guest suites were imported from the ancient spice island of Zanzibar; carved out of African mahogany, the exotic four-poster king-size beds give the rooms the appearance of a sultan’s private quarters. It is said that ‘Karoo food is as limitless as the land – vast, diverse, all consuming. And like the land, the cuisine captivates visitors, enticing them back time and again to experience the culinary delights,’ Karoo Cookbook, 2009. Camdeboo Manor allows you a glimpse into this experience, offering delicious homemade pies served with seasonal vegetables, a selection of home-grown steaks and braai facilities at the poolside. Click here to enquire at Camdeboo Manor.